Research background: In this article the characteristics of the terms of an entrepreneurship of a region and a local development were presented. Likewise, it demonstrates the results of research about using the development model method to classify special economic zones (SEZ) in terms of the most important indicators referring to the economic activity of zones in Poland, as well as showing the potential of zones — by noting their advantage or distance in relation to another zone in terms of criteria for functioning of privileged areas forming together a group. Purpose of the article: The aim of the article is to show the possibility to use a multidimensional comparative analysis method to recognize the level of a region’s development in a time-space system on the example of SEZ operating in Poland. Methods: The essential data source about the article’s description were reports published by the Ministry of Economy and then the Ministry of Enterprise and Technology: Information on the implementation of the Act on Special Economic Zones. The empirical analysis used the method of multidimensional comparative analysis used to recognize the diversification of the functioning of fourteen SEZ operating in Poland in a time-space system. The examination procedure covered the years 2009–2017. A constant development pattern was adopted for all the years of the study. Findings & Value added: The results of conducted analysis show that in SEZ there were real development processes. However, these processes were accompanied by persistent disproportions in the level of development of individual zones. Act of 20 October 1994 on Special Economic Zones, JL 1994, no. 123, item 600. Ambroziak, A. (2016). Income tax exemption as a regional state aid in special economic zones and its impact upon development of Polish districts. Oeconomia Copernicana, 7(2). doi: 10.12775/OeC.2016.015. Ambroziak, A., & Hartwell Ch. A. (2018). The impact of investments in special econimic zones on regional development: the case of Poland. Regional Studies, 52(10). doi: 10.1080/00343404.2017.1395005. Balcerzak, A. P. (2011). Taxonomic Analysis of the quality of human capital in the European Union in 2002-2008. Prace Naukowe Uniwersytetu Ekonomicznego we Wrocławiu, 176.
the European Union countries. Economics & Sociology, 9(2). doi: 10.14254/ 2071-789X.2016/9-2/1. Latin-American economies: consolidation of the double diamond theory. Economic Systems, 40(3). doi: 10.1016/j.ecosys.2015.10.003. Cheba, K., & Szopik-Depczyńska, K. (2017). Multidimensional comparative analysis of the competitive capacity of the European Union countries and geographical regions. Oeconomia Copernicana, 8(4), doi: 10.24136/oc.v8i4.30. Hajduga, P., Pilewicz, T., & Mempel-Śnieżyk, A. (2018). 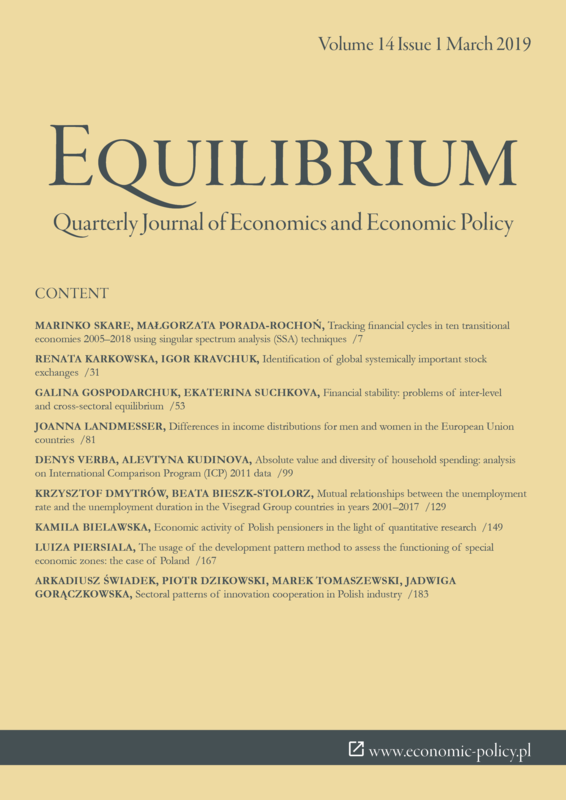 Cooperation between local authorities and economic entities in Polish economic zones – evidence from Lower Silesia in Poland. Economics and Sociology, 11(2). doi: 10.14254/ 2071-789X.2018/11-2/6. Heffner, K., & Gibas, P. (2007). Analiza ekonomiczno-przestrzenna. Katowice: Wydawnictwo Uniwersytetu Ekonomicznego w Katowicach. Hellwig, Z. (1968). Application of the taxonomic method to the typological division of countries due to the level of their development and the resources and structure of qualified personnel. Przegląd Statystyczny, 15(4). Klasik, A. (2006). Przedsiębiorczość i konkurencyjność a rozwój regionalny. Synteza wyników projektu badawczego. In A. Klasik (Ed.). Przedsiębiorczość i konkurencyjność a rozwój regionalny. Katowice: Prace Naukowe Akademii Ekonomicznej w Katowicach. Kola-Bezka, M. (2012). Multivariate comparative analysis as a tool for regional management - the example of the Kujawsko-Pomorskie Province. Studia i Materiały. Miscellanea Oeconomicae, 2. Kongolo, M. (2010). Job creation versus job shedding and the role of SMEs in economic development. African Journal of Business Management, 4(11). Kosiedowski, W. (2013). Przedsiębiorczość i innowacyjność w procesie rozwoju regionów Europy Środkowo – Wschodniej. Toruń: Wyd. Naukowe Uniwersytet Mikołaja Kopernika. Krawczyk-Sokołowska, I. (2012). Innowacyjność przedsiębiorstw i jej regionalne uwarunkowania, Częstochowa: Politechnika Częstochowska, Wydział Zarządzania. Meyer, N., & Meyer, D.F. (2017). Best practice management principles for business chambers to facilitate economic development: Evidence from South Africa. Polish Journal of Management Studies, 1(5). doi: 10.17512/pjms.2017. 15.1.14. Młodak, A. (2006). Analiza taksonomiczna w statystyce regionalnej. Warszawa: Difin. Nowak, P. (2018). Regional variety in quality of life in Poland. Oeconomia Copernicana, 9(3). doi:10.24136/oc.2018.01. Ordinance of the Council of Ministers of 10 December 2008 on criteria of covering some land with a special economic zone. Official Journal 224/1477. Pastusiak, R. (2011). Specjalne strefy ekonomiczne jako stymulator rozwoju gospodarczego. Łódź: Wydawnictwo Uniwersytetu Łódzkiego. Pearce, R., & Zhang, S. (2010). Multinationals' strategies for global competitiveness and the sustainability of development in national economies. Asian Business & Management, 9(4). doi: 10.1057/abm.2010.29. Pilewicz, T. (2013). Region jako organizacja przedsiębiorcza w zarządzaniu strategicznym. Kwartalnik Nauk o Przedsiębiorstwie, 3. Poliński, R. (2010). Teoria i polityka rozwoju regionalnego. In M.G. Brodziński (Ed.). Gospodarka regionalna i lokalna wybrane zagadnienia. Warszawa: Almamer Wyższa Szkoła Ekonomiczna. Information on the outcomes of the Act on Special Economic Zones, as of December 31, 2013-18]. Warsaw: Ministerstwo Gospodarki & Minsterstwo Przedsiębiorczości i Technologii. Rustidja, E. S., & Purnamawati, A., & Setiawati, R. (2017). Investment Promotion for Community Economic Development of Special Economic Zone: Study of Sez Mandalika and Bitung in Indonesia. European Journal of Economics and Business Studies, 8(2). doi: 10.26417/ejes.v8i1.p138-147. Strahl, D. (1998). Taksonomia struktur w badaniach regionalnych. Wrocław: Wydawnictwo Akademii Ekonomicznej we Wrocławiu. Suchecki, B. (2010). Ekonometria przestrzenna. Metody i modele analizy danych przestrzennych. Warszawa: C.H. Beck. Thompson, E. (2004). The political economy of national competitiveness: ‘one country, two systems’ and Hong Kong’s diminished international business reputation. Review of International Political Economy, 11(1). doi: 10.1080/ 0969229042000179767. Zawada, M. (2007). Zastosowanie metod ilościowych w badaniach ekonomiczno-społecznych. Częstochowa: Politechnika Częstochowska.